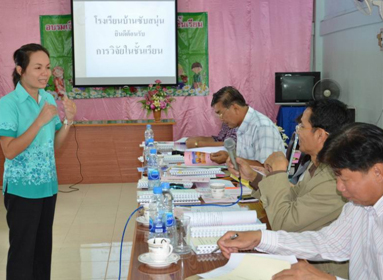 The SEAMEO Secretariat promoted classroom research practices among teachers in its two adopted schools in Thailand through a pilot project called “SEAMEO Classroom Research Workshop Series” under its Community Involvement Programme. The initiative was launched in June 2012 and was completed in August 2013 benefiting 24 teachers through five training workshops. The initiative was aimed at assisting teachers in identifying solutions to challenges related to teaching and learning by conducting their own classroom research. The regular meeting of the SEAMEO Executive Committee this year was convened on 30 August 2013 at the SEAMEO Secretariat, Bangkok, Thailand to discuss various organizational concerns and review implementation of existing and new initiatives particularly those that respond to the resolutions of the SEAMEO Council. 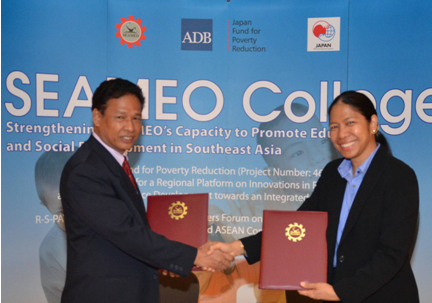 Thailand confirmed its support to the implementation of “SEAMEO College”, a regional platform on innovations in education and human resource development and SEAMEO’s flagship project in a signing ceremony and exchange of notes between Thailand and the Asian Development Bank on 7 August 2013 at the S31 Hotel, Bangkok, Thailand. As SEAMEO Member Country, Thailand serves as host to the SEAMEO College project management office which will be housed at the SEAMEO Secretariat in Bangkok. 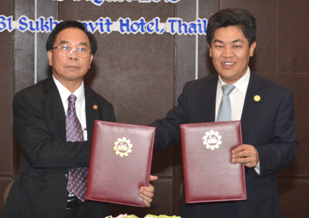 Thailand will also be the venue of various activities and management meetings under the project. SEAMEO and ASEAN-China Centre (ACC) signed a memorandum of understanding (MOU) for the establishment of a general framework for cooperation on the development and promotion of education and culture in Southeast Asia and the People’s Republic of China on 13 August 2013 at the S31 Hotel, Bangkok, Thailand. The MOU identifies collaborative areas that are of common interest to both organizations. It outlines the development and implementation of joint initiatives on education and culture such as knowledge sharing, joint research efforts on education and culture, and co-organization of education expositions, forums, seminars and conferences.